In last 4-5- years a concerted campaign is on to spread confusion about the identity of the conspirators/killers of Mohandas Karamchand Gandhi, also known as Father of the Nation. 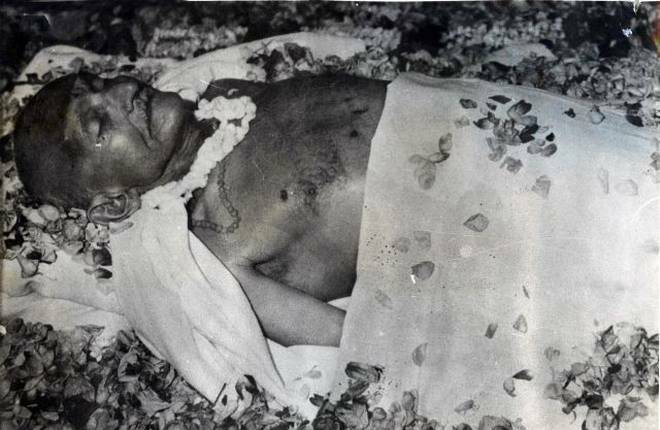 He was assassinated on January 30, 1948 at Delhi. After prolong hearings Nathuram Godse and Narayan Apte were sentenced to death and six others including Godse’s brother, Gopal Godse were sentenced to life imprisonment. Savarkar was also tried for conspiring to kill Gandhi but was acquitted due to lack of evidence. In a surprising move the highest court of justice in India, Supreme Court on October 6, 2017 admitted a petition filed by one Pankaj Phadnis who also happened to be a trustee of the Abhinav Bharat, an organization with linkages to Savarkar in the past claiming it was one of the biggest cover-ups in history. Court which was initially of the view that “nothing can be done in law” in the case which was decided long ago, changed its opinion by admitting the plea for reopening the Gandhi murder case. It even appointed senior advocate Amarender Sharan as an amicus curiae in the matter to examine the petition and documents provided by Phadnis.Anyway, reopening Gandhi murder case is going to be an impossible task as according to the official responses, researchers’ findings and press reports many of the related documents have gone missing, files discarded and are not available in a separate dossier as is the case with Subhash Chandra Bose disappearance/death case. When Tushar Gandhi, the great-grandson of Mahatma Gandhi sought intervention in the case opposing the plea for seeking reopening of the 70-year-old assassination case of Gandhi, Bench of Justices S.A. Bobde and M.M. Shantanagoudar questioned the locus standi of Tushar Gandhi in the case. Shockingly, great-grandson of the murdered Gandhi was questioned about his right to intervene in the case but the petition of Phadnis who was neither related to Gandhi nor to the killers was entertained. I did fire the shots at Gandhiji on 30th January 1948, on the prayer-grounds of Birla House. I do say that my shots were fired at the person whose policy and action had brought rack and ruin and destruction to millions of Hindus”. According to Nathuram Gandhi was killed because he had “proved to be the Father of Pakistan. a simple incident of holding a pistol in hand and shooting. If somebody treats it as such then that person is illiterate. Any human killing is not so simple and Gandhi killing absolutely was not so simple…It was a historic and unparalleled incident. Such incidents take place infrequently in ages. No, these do not occur even in ages. The killers were proud of this sinister killing of an unarmed old man busy in prayer which they claimed was a rightful act by the Hindu nationalists. The supporters of Savarkar and RSS have been putting forward the justification of Gandhi’s killing that it was a reaction from the Hindu youth to Gandhi’s support to the Partition of India. It is a blatant lie for two reasons. Firstly, Out of the Congress top leadership it was Sardar Patel who was the first leader to agree to the Partition. Gandhi was the last to fall in line. Moreover, the Muslim nationalists specially the Muslim League denigrated and continues to decry Gandhi as a father of Hindu nation. Beginning with the year 1934 over a period of 14 years, as many as six attempts were made to kill Gandhiji. The last one by Godse on January 30, 1948 was successful.The remaining five were made in 1934, in the months of July and September 1944, September 1946 and January 20, 1948. Godse was involved in two previous attempts. When the unsuccessful attempts of 1934, 1944 and 1946 were made, the proposal regarding Partition and the release of Rs 55 crore to Pakistan were not in existence at all. The reality is that the murder of Gandhi was the outcome of a ferocious challenge from the Hindutva organizations like RSS and Hindu Mahasabha to Gandhi’s idea of an all-inclusive India. Gandhi despite being a devout Hindu fought for an independent India which would accommodate people of different religions, cultures with equal rights. On the contrary, both RSS and Savarkar wanted India to be an exclusive Hindu nation where minorities specially Muslims and Christians, declared to be the followers of foreign religions, would be cleansed as Hitler and Mussolini did in case of Jews. Interestingly, they were not willing to accord the indigenous religions like Buddhism, Sikhism and Jainism status of independent religions. For Hindutva ideologues these religions were part of Hinduism. Savarkar in his work Hindutva (1923)which the British rulers allowed him to pen when he was in jail, declared India to be the land of Hindus since times immemorial. Not surprisingly, colonial masters allowed publication of this communally polarizing book when freedom struggle under Gandhi’s leadership was turning into mass movement of all communities. It was followed by MS Golwalkar’s We Or Our Nationhood Defined (1939)which became a Bible for Hindu separatists who like the Muslim separatists were out to fracture the joint freedom struggle against the White Masters. Gandhi became an enemy also for the reason that he vehemently opposed the demand of the RSS and Hindu Mahasabha that Manusmriti which decreed sub-human status to Sudras and Hindu women should be adopted as the constitution of India. Gandhi stood in support of a democratic-secular polity. Let us no longer allow ourselves to be influenced by false notions of nationhood. Much of the mental confusion and the present and future troubles can be removed by the ready recognition of the simple fact that in Hindusthan only the Hindus form the nation and the national structure must be built on that safe and sound foundation…the nation itself must be built up of Hindus, on Hindu traditions, culture, ideas and aspirations. It was this hatred for a democratic-secular India that Gandhi who unambiguously guarded this idea became the natural victim of the Hindutva cadres. As regards the RSS and the Hindu Mahasabha, the case relating to Gandhiji’s murder is sub judice and I should not like to say anything about the participation of the two organizations, but our reports do confirm that, as a result of the activities of these two bodies, particularly the former, an atmosphere was created in the country in which such a ghastly tragedy became possible. There is no doubt in my mind that the extreme section of the Hindu Mahasabha was involved in the conspiracy. However, the Justice Jivan Lal Kapur Inquiry Commission (established in 1966 to probe into the conspiracy of Gandhi murder) came out with its report in 1969 in which he concluded that the facts taken together undermined “any theory other than the conspiracy to murder by Savarkar and his group”. It is also a matter of serious investigation why Savarkar’s acquittal by the trial court was not challenged in the higher courts. There is a meaningful parallel between the acquittal of the Muslim League leaders accused in the Allah Bakhsh Murder Case in 1945 and Vinayak Damodar Savarkar’s acquittal in the Gandhi Murder Case in 1949. These were Khan Bahadur Khuhro and his brother Mohammed Nawaz (both leaders of the Muslim League) who were discharged of the accusation of conspiring to kill Allah Bakhsh. In the Allah Bakhsh Murder Case, despite the statements of two approvers (Daresh and Mohammed Khan) and in the Gandhi Murder Case despite Digambar Badge’s testimony (that it was Savarkar who played the most important role in the conspiracy to kill Gandhi), the persons who were accused of conspiring were released because there was no ‘independent evidence’ to prove the conspiracy. The law demanded that when conspiracy was being hatched, and if it was to be proved in a court of law, there should be corroboration by some independent witness. Of course, it would be an impossible task to find an ‘independent evidence’ when conspiracies are hatched in the utmost secret surroundings. However, this was the law and persons accused of conspiring to kill Gandhi (Savarkar) and Allah Bakhsh (Khuhro Brothers) were let off. With the ascendency of Hindutva politics under the RSS/BJP leadership different Hindutva organizations have been celebrating the ‘vadh’ (it is killing of demon part of a Brahmanical ritual) of Gandhi with great pomp and show. Temples glorifying Godse have been built up where Godse is worshipped. This is not being done by only some fringe organizations. Within few months of Modi becoming PM of India a senior RSS/BJP leader who isalso a member of the current Indian Parliament, Sakshi demanded recognition of Godse as a ‘patriot’ like Gandhi which he was forced to withdraw after world-wide condemnation. As Bhagwan Shri Krishna said in the Gita, Paritranaya Sadhunam Vinashaya Cha Dushkritam/ Dharamasansthapnaya Sambhavami Yuge-Yuge (For the protection of the good, for the destruction of the wicked and for the establishment of righteousness, I am born in every age) On…30th January 1948 evening, Shriram came in the form of Nathuram Godse and ended the life of Gandhi. Dharma Drohis must be killed’, ‘Not killing the deserved to be killed is great sin’ and ‘where the members of Parliament seeing clearly allow to kill Dharma and truth as untruth, those members will be called dead. It is sad that Gandhi who laid down his life for a democratic-secular India continues to be denigrated by the Hindutva gang. It is unbelievable but true that in the buildings of Mahrashtra Legislative Assembly and the Indian Parliament Gandhi’s portraits share space with Savarkar’s. It is sure that Gandhi and those who laid down their lives for a democratic-secular India do not deserve such an atrocious treatment. Gopal Godse, Gandhi Vadh Aur Maen, Surya Bharti Prakashan, Delhi, 2000, pp. 36-38. Letter 64 in Sardar Patel: Select Correspondence1945-1950, volume 2, Navjivan Publishing House, Ahmedabad, 1977, pp. 276-77. Cited in Justice on Trial, RSS, Bangalore, 1962, pp. 26-28. Allah Bakhsh (1900-1943) former Prime Minister of Sind, was a great freedom fighter. He was not a Congress leader but when Winston Churchill used derogatory words for the Quit India Movement he as PM of Sind returned all British awards and was subsequently dismissed form Prime Ministership of Sind. He organized the Muslims of India under Independent Muslims’ Conference 1940 onward against the demand of Pakistan. Since he was proving a great hurdle in the communal designs of the Muslim League, he was assassinated on May 14, 1943 by the shooters hired by the Muslim League leaders. It is sad that this apostle of peace, freedom and a united India remains unknown in India.